I hope everyone had a happy and safe Halloween! 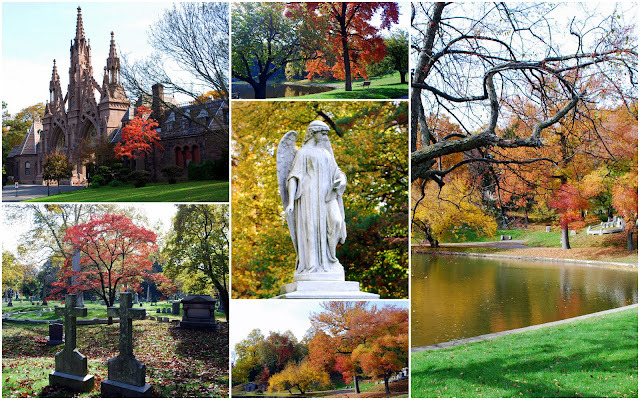 On Saturday I visited a place I've often blogged about, the magnificent and historical Green-Wood Cemetery located at 500 25 Street and 5th Ave, Brooklyn New York. Green-Wood has one of the finest collection of century-and-a-half-old trees in New York City, in addition to beautiful shrubs and flowers. The beautiful Gothic front gates of the cemetery are visible in the upper left of this mosaic and views around one of its glacier ponds. I knew that there would be beautiful autumn colors in the cemetery and I was not disappointed. As you can see in the images in the photo mosaic above the lovely warm autumn we've been having here this year in New York City has kept the grass green and the flowers growing. The trees were all dressed in glorious shades of orange, gold, russet and crimson. A mosaic of some of the flowers I saw in Green-Wood this weekend. 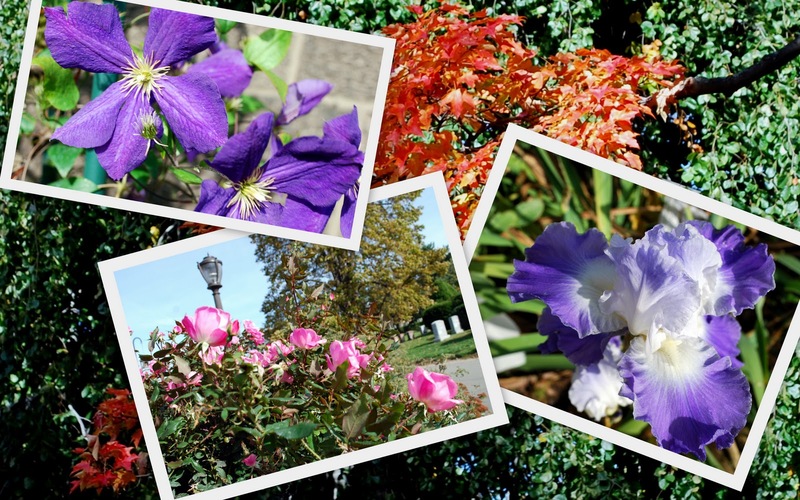 It's hard to believe that Clematis, Roses, Irises, were are all blooming so well in late October! I wonder when we'll get our first frost? I'll show more beautiful photos of the cemetery in my next blog post. No matter how many times I wander along its paths I always find something new to photograph. I have to say a special "Thank You" to "Simply Bags" for sending this beautiful monogrammed lap top bag to me as a gift! 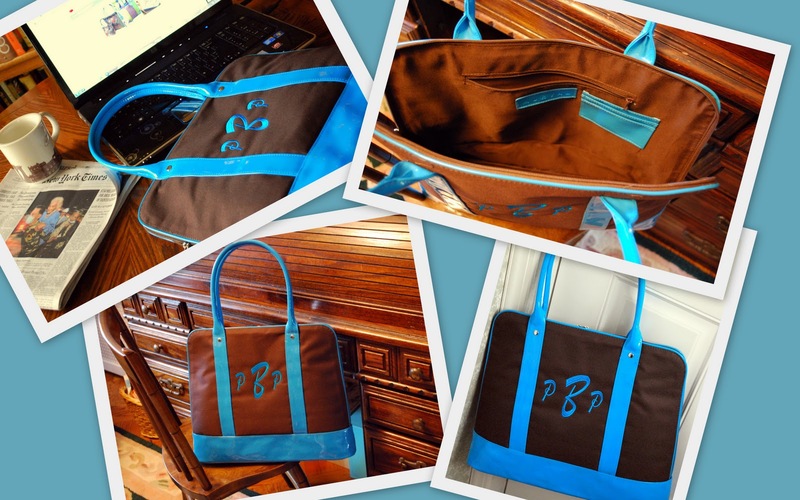 This stylish lap top bag is nice and roomy; made of dark brown colored canvas and blue patent trim, and the monogram is beautifully embroidered. The inside wall has a zipper pocket, and a pen and business card slot. It has a side to side zipper closure for ease in computer insertion and removal. The lengthy handles allow for comfortable underarm carry. I like that very much because I find it is easier to carry my laptop this way when I am handling all my other luggage. It has been nice to carry my lap top in it when I travel and I've also used it to carry my library books, as its nice and sturdy. * Disclosure: I received this monogrammed lap top bag from Simply Bags for free, value under $40, and no other compensation was received. My opinion of the bag is my own and I was not influenced or compensated in any way for this review. I'm adding this post to Mary of The Little Red House Mosaic Monday and Sally of Smiling Sally Blue Monday event. Please visit both lovely ladies and see their posts and the links to all the blogs participating in their events today! 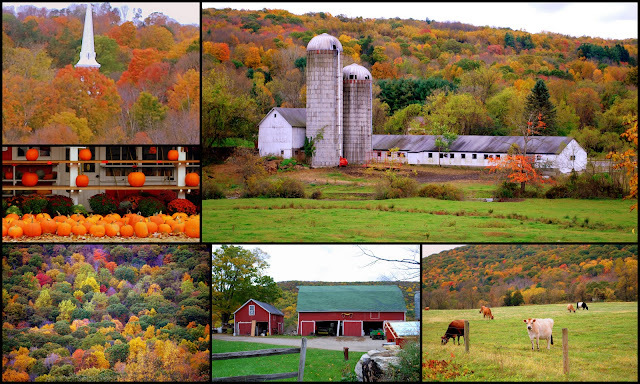 My husband and I had such a wonderful time driving through Litchfield County, Connecticut a week ago on a Fall leaf peeping trip that I'm finding it hard not to show all the photos I took, so the collage above is a representation of the many scenic sights that we saw along the way. Fall is such a lovely time of the year! The first is Lourdes in Litchfield, a ministry of the Montfort Missionaries since 1958. Located at 50 Montfort Road in Litchfield, Connecticut, the shrine is part of the grounds of Montfort House. The 35 acres is open to the public from dawn to sunset. The grotto replica Mary's apparition to Bernadette Soubirous in Lourdes, France and is a place meant for prayer and meditation. Outdoor services are held from May 1 to mid-October at the grotto, weather permitting. 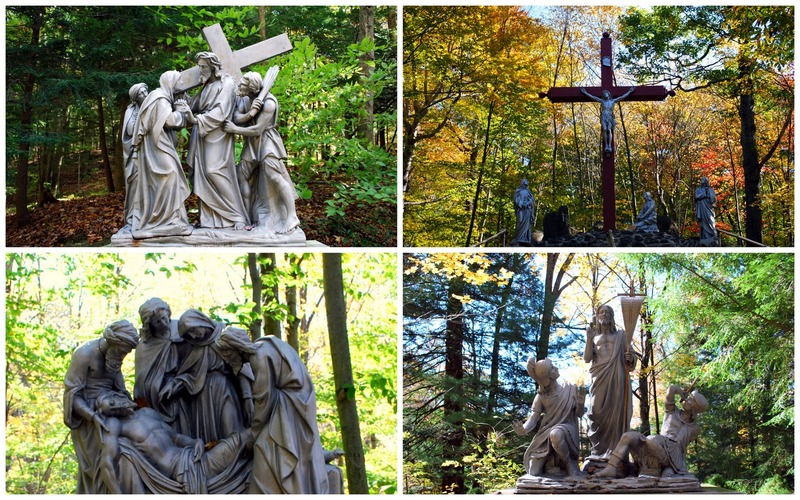 Past the grotto is a paved walking path up a hill that leads to the Way of the Cross. Large statues winding around the steep hillside show all the Stations of the Cross. It was inspirational to see them in such a beautiful and natural setting. Our next surprise is that there is a wine trail in Connecticut! Having recently visited Sonoma and Napa Valleys in California, where we visited many wineries, we knew we'd like to visit a counterpart in Connecticut and stopped at the Haight Brown Vineyard which resides on ten acres atop the historic Chestnut Hill in the town of Litchfield. Opened in 1973 it is Connecticut's first established winery! The grape harvest was already completed for the 2010 season, but the grapevines were still green. We decided to go inside and share a wine tasting. Since the growing season is short and the temperatures are cooler here than in California the Haight Brown Vineyards produces many white wines such as Chardonnay, Riesling, and Covertside White. They also have selections of strawberry and apple wines, and a limited selection of red wines made from imported grapes. We did our wine tasting with an accompaniment of cheese and chocolates which complimented the wines. It was an interesting way to try them! Last, we saw this pretty house in Litchfield that reminded us of many houses that we saw in Quebec, Canada, as it had a metal roof. The bright red roof is so bright and cheerful, don't you agree? I'm linking with Susan of A Southern Daydreamer for her blog's "Outdoor Wednesday" event, and Sue's "Rednesday" on her blog It's A Very Cherry World, and Cathy's "Adventure Express" on her blog A Bit of the Blarney and Jenny Matlock's blog for her "Alphabe Thursday" as this week the letter is "F" and I can't think of a better F than all these fall images! 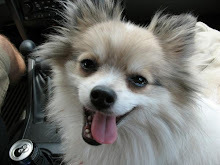 Please visit these blogs and join in all the fun! 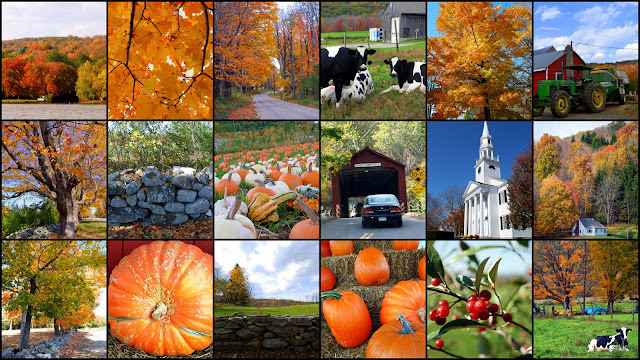 The Yankee Magazine article stated: "The heart of the New England leaf-peeping experience lies in the details: the farmstands and covered bridges, the waterfalls and antiques stores that provide the eye candy, framed by the colors of our most glorious season" writes Michael Blanding, author of the article. 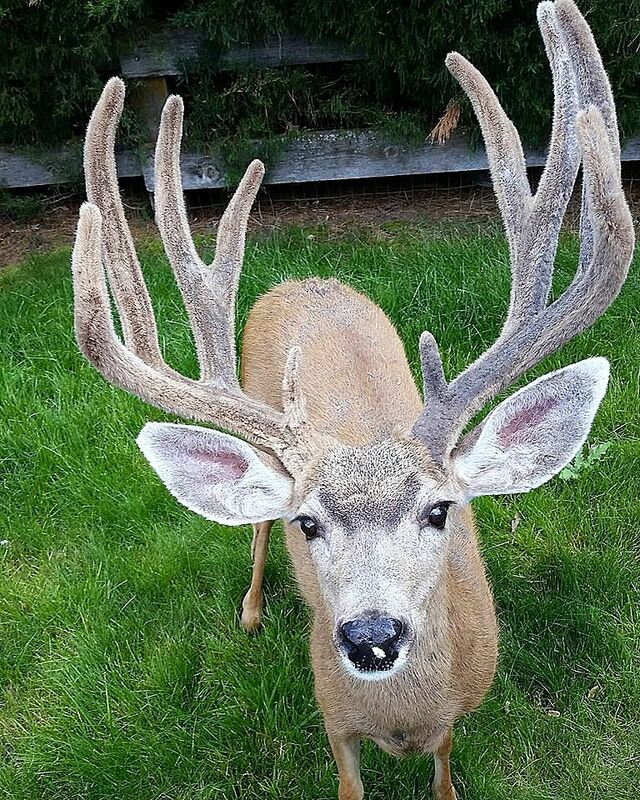 "All of these things Kent has in abundance, in a perfect blend of uncommon natural beauty and culture that might shame cities 10 times its size (just shy of 3,000 people in the 2000 census)." The Town of Kent, Connecticut, is located in the scenic northwest corner of Litchfield County. Incorporated in 1739, Kent had a history as a farming community and as a thriving iron ore producer. 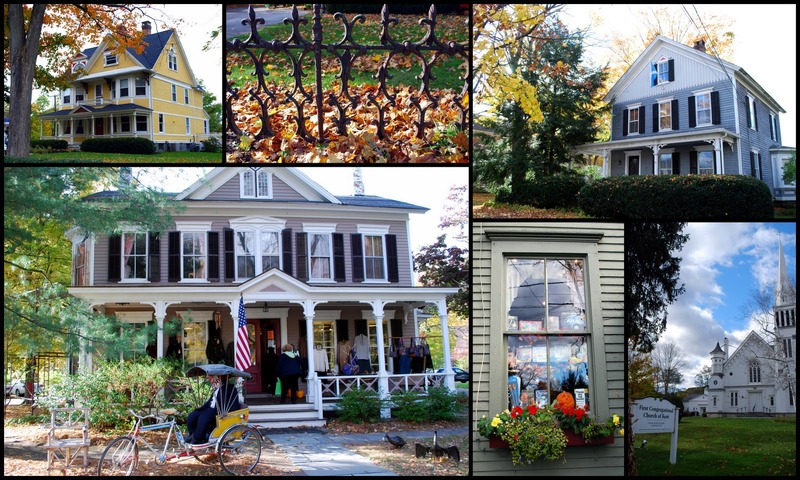 My husband and I enjoyed strolling down its North Main Street, admiring the beautiful houses, many of which now are commercial businesses, art and sculpture galleries and antique shops. The beautiful Kent Congregational Church has a history dating back to 1741. A large crow sculpture near one of the galleries. A vintage train engine near the Connecticut Antique Machinery Association located in Kent on U.S Rt. 7, less than a mile from the center of town. The Connecticut Antique Machinery Association is a non-profit, all volunteer organization and museum dedicated to the preservation, restoration, and demonstration of antique machinery from Connecticut's rich industrial and agricultural past. The Kent Memorial Library was having a giant outdoor book sale which captured my attention for an hour. I was happily browsing all the books when I saw a sign that for $6 I could buy a bag and fill it with as many books that could fit! Here is some of the selection that I came away with. Kent Falls is a series of several waterfalls, dropping 250 feet in under a quarter mile, located in Kent Falls State Park. The largest cascade drops more than 70 feet into a reflecting pool, before traveling over the lesser falls. My husband and I climbed a steep trail that follows the path of the falls to the top with intermittent platforms to view them, to take this series of photos. To get a perspective of their size look at the upper right hand photo and you can see people standing near one of the cascades. According to the Department of Environmental Protection website information about Kent Falls State Park: "Kent Falls, located in the northeastern section of the town of Kent, is a series of waterfalls on a mountain stream known as Falls Brook. The stream begins in the town of Warren, draining an area of six or seven square miles. It then flows west to the big fall where it plunges approximately 70 feet in a dramatic cascade. 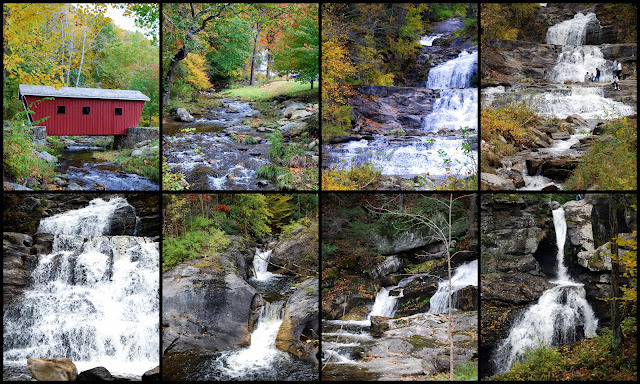 From here the stream descends in a series of lesser falls and cascades to the valley, where it enters the Housatonic River some 200 feet below the brink of the big fall only a quarter mile away. Much of the limestone over which the brook flows has been carved into interesting shapes including numerous potholes of all sizes." 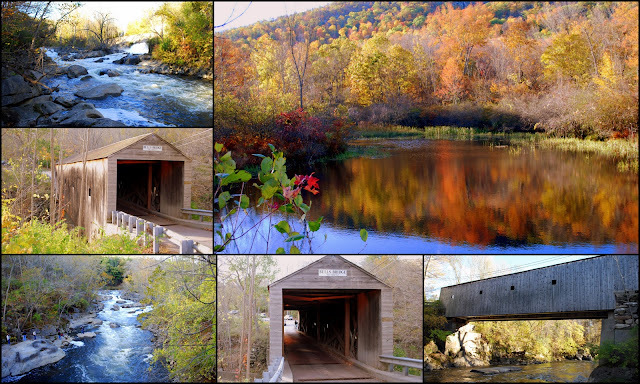 Bull's Bridge, built in 1842, is a single-lane vehicular wooden covered bridge across the Housantonic River in the town of Kent, Connecticut. It is one of three remaining covered bridges in Connecticut dating from the 19th century. (To see the very scenic West Cornwall Covered Bridge see my prior blog post). George Washington crossed the Housatonic River near the site of the present bridge in 1781. We really enjoyed our ride through the back roads around Kent on a beautiful autumn day. 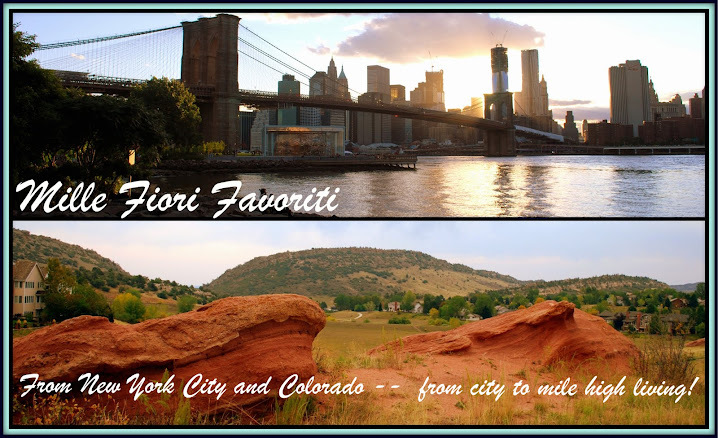 It certainly was a wonderful area to visit and I hope these photo mosaics enticed you to plan a trip to this area one day. I'm linking to Mary of The Little Red House "Mosaic Monday" Please visit Mary today to see her beautiful mosaic and links to all the blogs participating today. Thanks, Mary! Autumn of 2010 in New York has been warm, but stormy, and it appears the fall foliage will be less than spectacular this year as many trees have already lost their leaves. So this past weekend my husband and I decided to take a two hour drive up north to Connecticut to see if this New England state would satisfy our urge for autumn leaf peeping. There was definitely much more autumn color, but even here many of the tress had lost their leaves from the nor'easter storm that had recently passed through. There were trees in shades yellows and oranges, but not many were this brilliant shade of red. Non-the-less, the scenery was beautiful! We drove up to West Cornwall so that we could drive over their historic one lane red colored covered bridge. After we drove over the bridge I walked back inside it to take these views from a few of the windows. The Housatonic River as seen from a covered bridge window, facing west. In 1973 the Connecticut Department of Transportation rehabilitated the bridge by inserting a concealed steel deck to support the weight of traffic.The bridge was listed on the National Register of Historic Places in 1975. We sat by the river for awhile, enjoying the peaceful view. We then walked through part of the charming town of West Cornwall. There we saw that in this quaint toll house overlooking the Housatonic River, Ian Ingersoll makes reproductions of Shaker furniture. A pretty residential home whose front garden's pink roses were still blooming! Across the street, these attached houses were a pretty shade of pink! Todd Piker's Cornwall Bridge Pottery Store, is 5000 square feet and covers two floors. It showcases an ever-changing exhibitions of functional hand-thrown, wood-fired pottery that Piker has been crafting for over 35 years. We were tempted to buy that last whoopie pie on the pink dish, but instead bought a large oatmeal cookie to share, as we are trying to be diet conscious. One of my favorite sights in the town was this colorful sculpture of a rooster standing amid the pink rose bush. He's made from an old red Mobil Oil drum! I thought he had a lot of personality! What do you think? 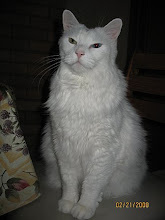 I have more photos from our get away that I'll show next time, but for today I'm linking to Susan's Outdoor Wednesday, Sue's Rednesday, Cathy's Adventure Tour Express, Sandi's Friday Favorites Linky Party, and Beverly's Pink Saturday. 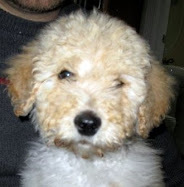 Please visit all the blogs to join in the fun! Photo Safari Weekend and Two Sweet Surprises!